With the Plenary Council in 2020 Catholics are asked to reflect on and respond to three questions. One of my responses went along the lines of asking that the Australian Catholic Bishops make clear the Sunday obligation. Thankfully Archbishop Leo Cushley has made a clear statement about this issue. It is true that many people think of Sunday as just part of the weekend, a welcome break from the usual routine, and perhaps a day for family, or sporting activities and so on. Naturally, it's good to relax and make time for these things, but our culture has largely forgotten that Sunday is a weekly holiday because of its meaning as the Christian holy day. God commanded his chosen people to refrain from ordinary work for one day at the end the week. That "Sabbath", now our Saturday, reminded them that life has a higher goal than physical survival or financial gain. True fulfilment lies in relationship with our Creator and our hearts will always be restless until they rest in Him. So, the working week ended with everyone gathering in God's presence to offer sacrifices from the fruits of their labours and to receive renewed blessings through the hands of his priests. That weekly day of rest was an earthly reflection of God's own eternal restfulness. It was a constant commemoration of the Covenant between God and his people and also looked forward to a time when they would enter into his heavenly peace through the coming of the Messiah. 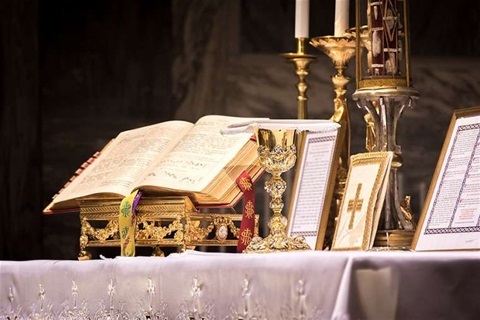 When we gather for Mass on Sunday it is a foretaste of heaven. Because Jesus is truly present on our altar, all the angels and saints gather with us for the feast too (cf. Hebrews 12:22). We are caught up together in adoration of the Lamb of God, who sacrificed Himself to take our sins away and draw us into his divine life through communion with his own Body and Blood. Every Mass is actually that one same sacrifice offered throughout time and space. It is only this great Sacrifice that enables us to live authentically holy lives. It is only this Blessed Sacrament of his Body and Blood that empowers us to do real and lasting good in the world. Jesus Himself said that it is only if we are joined to Him in the Eucharist that we can hope to be saved for eternal life (cf. John 6:53). If we cut ourselves off from this mystery of grace, we not only cut ourselves off from Him but from one another too. The community of God's people is impoverished by your absence. Of course, there can be unavoidable circumstances that prevent our coming to Mass; illness or caring for a sick child, for example; travelling abroad too, although in these days of the internet we ought to be able to plan ahead. But under normal circumstances, attending Mass on Sunday is a solemn and binding obligation. If we fail in this matter, it is a grave sin and we must go to confession before receiving communion again (cf. Catechism of the Catholic Church, 2181). Dear parents, you naturally want your children to achieve their full potential and find lasting happiness. There's no better thing you can do for them than to bring them to meet the living Lord Jesus at Mass every week. If you teach them like this to seek the Kingdom of God first, you can be sure He will bless them in all the other ways that you hope for (cf. Matthew 6:33). I know it isn't always easy in our secularised world. It may mean making sacrifices and standing up for your faith among friends or within families. But remember, Jesus already sacrificed everything for us, because He did not want anyone to be lost. At many times in the past, people have died for the Mass, and even today in some parts of the world our fellow Catholics risk their lives in order to get to Mass, because they believe that True Life depends on it. And they are right. Christ is our Life and the Mass is our lifeline. I therefore urge you, my dear brother and sisters, to make the choice to attend Sunday Mass, to make it a priority, and to bring others with you.